upstairs at the Viking Bar and Restaurant in Viroqua, Wisconsin. Zydeco Paydirt plays nothing but zydeco, the dance music found in the roadhouses of southwest Louisiana. Featuring the two-steps and waltzes of favorites Boozoo Chavis and John and Geno Delafose, along with a mix of originals, this is music meant to make you get up and dance. Read more about Zydeco here. The band is lead by Joel Johnson on accordion and vocals. Kent Peterson on bass and Paul Loughridge on drums make up the rhythm section, and Jim Lupino on guitar and Mark Johnson on rubboard round out the architects of this danceable groove. 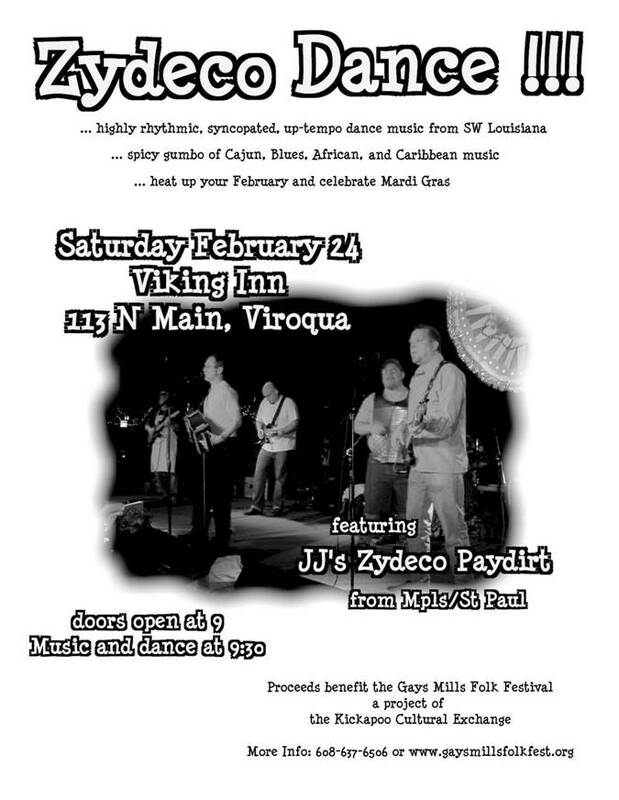 JJ's Zydeco Paydirt has performed at numerous venues and events in the upper Midwest over the last 10 years. These include the Cedar Cultural Center, the Medina Ballroom, Café Montmarte in Madison, WI, Fortune Bay Casino in Tower, MN, The Cabooze, The Half Time Rec, Dixies on Grand, Grand Old Days, the Minnesota State Fair, the University of Minnesota, and wedding receptions, corporate events, and parties. Paydirt has opened for such internationally famous bands as Beausoleil, Buckwheat Zydeco, NRBQ, CJ Cheneir and Chubby Carrier. We hope you enjoy the show and, don’t be surprised if you find yourself suddenly dancing to the zydeco beat.